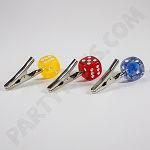 Cigarette clips are available in two different styles, billiard balls and dice. The dice cigarette clips come in a packs of 5 and are available in red, blue and yellow color options. 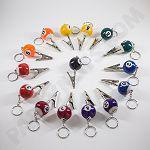 The billiard ball cigarette clips come with a key ring attachments, are available packs of 5, and are available in green, blue, purple, red, orange, yellow, and black color options.